On this date in 1591, Scotsman John Dickson was condemned to death (which he immediately suffered) for murdering his father. 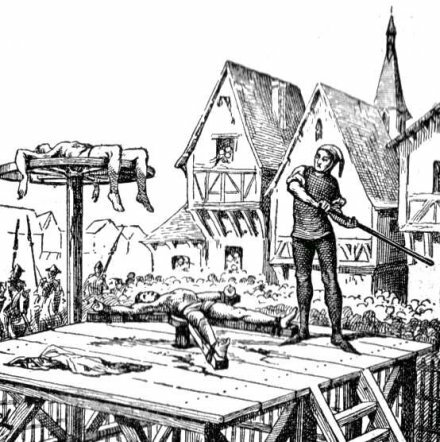 What is particular to this case is the method of execution: the breaking-wheel, or something very similar to it, a tortuous death used throughout continental Europe but that never caught on in the British Isles. I guess if that’s accurate the text reads as if they broke him on the rack but then were nice enough to strangle him off at the end of it instead of leaving him to the lingering death of hours afterwards? Sometimes breaking death sentences enjoyed a merciful coup de grace before all the bone-smashing, but you’d think they would say “worried” before “broken” were that the case here. He had reason to be worried, but what part of the ritual does this signify?